This was my thought as I left for work that morning. There was a reason that I thought this. But it is not one that I can elaborate upon. The day before I had received some extremely shocking, painful news that left me very concerned for people I care about. I had done what little I could, had got angry, shed a few tears, gone into a type of resourceful shock that is familiar to me. A place from which I can find solutions, actions, before (perhaps instead of) processing the emotional impact of things. At work, apart from this worry sitting on my shoulders like a pair of remorseless Buzzards, it was a normal day, I was ploughing through my inbox, but then, at about 11.30 a friend tweeted me, it was an aside to say that a man I barely knew at all, a man who only existed on the very fringes of my own existence, had died. That man was named Horace White, and he was a person whom I saw occasionally pushing his trolley along the streets of East Finchley, where he lived. The only words he ever said to me, that I recall, were ‘best of luck’, the greeting and parting wish he gave to all he met. He died, aged 54, two days ago. People, young people mainly, would sometimes mock him, taunt him with the name ‘Stanley’, which he hated and which would lead him to erupt into harmless but profane outbursts, I have seen this happen on a bus, and been partly concerned and then politely amused. He would spend time sitting outside McDonalds and Barclays on Finchley High St, drawing colourful pictures with his crayons and giving them to those who asked for them. I read one story on his tribute Facebook page that he used to keep all of his crayon drawings in his suitcase but then one night left it outside the Post Office, the bomb squad were called and blew it up. There were some tears in my eyes as I watched a video on youtube of him saying ‘best of luck’ to the camera. He seemed confused, lost, gentle, kind. Childlike. Even in the other unpleasant videos on the site in which he was provoked into shouting, there was no threat to his behaviour, it was childish, a tantrum. 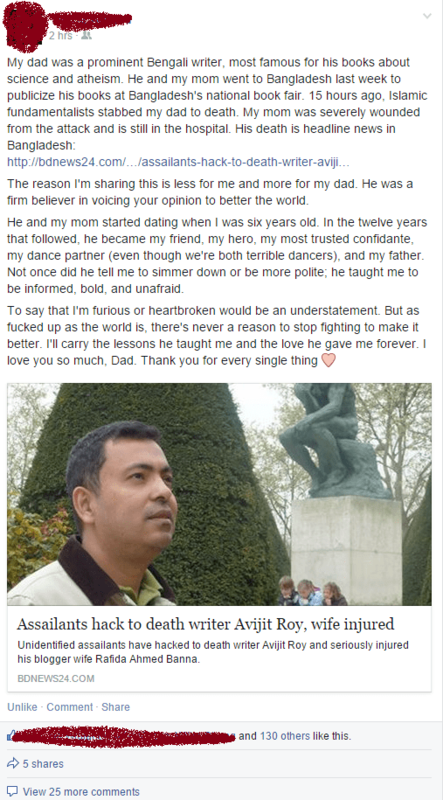 And some of the tears were for The Situation I was worrying about, which – in a way that I couldn’t explain well even if I felt able to write freely about it – correlated with this man’s death. I don’t mean to be frustratingly enigmatic, but I feel that even without the specifics what I have to write, to put out from within me to here, still holds true, has meaning. At lunchtime I bought some Monkfish (special offer, for dinner that evening) from a supermarket and then I found myself wandering to Tavistock Square, where I stood before the statue of Gandhi looking at the messages and objects people had left there in the alcove beneath where he sits. The pain of The Situation was raw, raw and confusing enough to me that I wished I believed in the God’s of man, but I don’t. I looked at the quote from the bible that someone had placed in the shrine, Matthew something or other, I looked at another quote, it was a Hindi quote about the universe coming from the deathless self. I saw a pack of self-help cards that someone had left, seemingly for someone in need to take. None of these objects were of any use to me, but the motive behind them was. That people genuinely want to help others, that matters. That reached me. And then a voice called out to me. Quietly. It was a man, a homeless man, his trolley and his possessions scattered about him on his bench. He was grimy and his fingernails were horribly long, he had a white and ginger beard, he may have been in his 50s, or his 40s, perhaps even, like me, in his 30s. He pointed at my supermarket bag. ‘I don’t have any sandwiches, this is fish’ I explained. ‘Do you want some money for a sandwich?’ I said, reaching into my pocket for some change. I was being dismissive. ‘I can’t walk anywhere’, he said to me, and he lifted up his trouser leg to show the sores on his leg. So I walked back the way I had come, I looked at some options, trying to decide upon what would be the most robust and well balanced option, eventually settling on a large roast beef and salad bloomer on brown bread. It may have been my own hunger dictating the choice. I walked back to him with the sandwich, and he asked me to open it for him (his hands clumsy and dirty, his extremely long fingernails handicapping him) I did so and he took it gratefully. ‘God bless you’, he said. I stood in front of him. ‘Do you visit the NHS?’ my question came out clumsily, but he answered it with a ‘no’. I stood there for a moment longer, wondering what I should do. And in the end I just walked off, leaving him eating the sandwich. I walked off because I am not a saint, I am not even a good person. I am just a normal, lost person, like all of us, and I was still hungry, and I had phone calls to make, and I did not have the time to spare in my lunch break to do any more than give a man a sandwich. All of us is lost because not one of us has any idea truly of why we exist, we come into the world full of bright possibility and hope, and then the whittling away at our innocence begins, the strange chaos of events, of other people’s pain and sadness and confusion and love and joy and cruelty touches us in ways we can’t ever know or forget, but underneath the isolation we strive to fashion for ourselves, the ‘I’, to protect us from the confusion of others, we are all connected in ways we can’t even see, by a filament of being. What was the story that led this man to be homeless on this bench, what cruelty, or love, or chaos had he known? What cruelty or love or chaos has led me to be where I am? What cruelty, love and chaos am I responsible for? I phoned the person who had contacted me the previous day hoping that I could help them with The Situation. They were far closer to it than me, and more terribly upset. As the phone rang I could see the chap eating the sandwich, he seemed happy enough, and I felt heartened a little by that simple fact. When I got through and I spoke to them, I tried to offer love and support and whatever practical help I could. I think I may have done some little good. We, all of us, affect all those around us. We all of us make a difference to people’s lives, even if we aren’t aware of it. This is a platitude, yes, but it is true. Horace White simply used to say ‘best of luck’ to the people he saw. That is not much, you might think, but it is infinitely more than silence. Gandhi, was he divine, or was he human, and as such did he display human tendencies, such as racism, in his time in South Africa? I was suprised upon viewing Newham Council’s website that they had chosen to promote ‘Black history month’ with an image of many notable black icons…and Gandhi. ‘Newham’s libraries are holding a series of free events throughout October to celebrate Black History Month. Gandi is an interesting choice for Black History Month. Most obviously because he was not black. Of course, Gandhi was a great freedom fighter and an heroic practitioner of non-violent protest. He also absolutely refuted any divinity attributed to him and refused to be called Mahatma. He acknowledged that he was just a man, and he was very honest about his flaws – in his autobiography he reflected that in his youth he was flawed, he beat his wife for instance. It is other people who have attributed to him a saintliness and perfection that simply is unrealistic. He has become symbolic rather than real and as such the facts of history have been obscured. The overtly racist caste system of the Hindu faith, where (to simplify) the blacker you are the more lowly you are (the untouchables) and the whiter you are the more divine (Brahmins) was bravely defied by Gandhi, who went on hunger strike to demand its abolition. But Gandhi’s contemporary B.R. Ambedkar points out that the truth is more complicated than this in his book ‘what congress and Ghandi have done to the untouchables’, here Gandhi is quoted as supporting the caste system in 1921, then proposing subtle changes to it, in 1925. Others, such as Mark Linley show that Gandhi’s ideas developed over time and that he came to see the need to destroy the caste system through intermarriage. My opinion is that Gandhi was a noble and brave man who did much good. That in his youth and life he was imperfect is no suprise and should not detract from his inspiring actions. But I think there is more value in knowing about him in his entirety rather than reducing him to a saintly charicature. He was a human being, human beings are complex, it is foolish and trite to blind yourself for the sake of simplicity or facility. History is more than just black and white. Gandhi was a great man, who unified Muslim and Hindu India through his non-violent efforts. I think he was more great for his own acknowledgement of his flaws, which was part of his practising of Ahimsa (do no harm). That level of honesty is more brave than the clumsy beatification of well meaning ignorance. 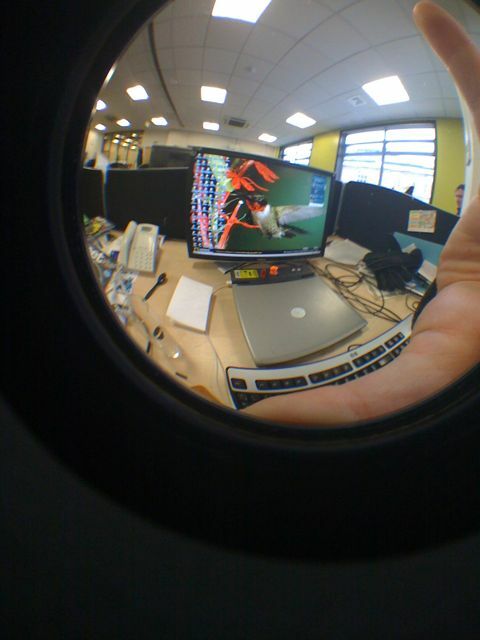 We found a fisheye lens in a vacated desk and so I tried to sync it with my iPhone’s own beady little eye. The results were poor, but they looked like this. Eyes evolved over the milennia from light sensitive cells, eyes that resemble the stages our own eyes have passed through exist throughout the animal kingdom still. One of the most curious eyes, perhaps, was that of the trilobite, the long extinct creature of Cretaceous (I think) seas. It had calcite rods for eyes. Creationists often refer to the eye as proof of an intelligent designer, yet optical illusions exist in abundance that demonstrate that our eyes are far from perfect. Not to mention the blind spot, and of course people being born visually impaired. Nonetheless eyes are amazing objects, balls of liquid that focus and transmit light, I am glad of mine.